The marchers started on Hollywood Boulevard and walked along the "Walk of Fame" to CNN's headquarters. "I've been sexually assaulted multiple times throughout my life," she said. "It's affected me in every aspect of my life." 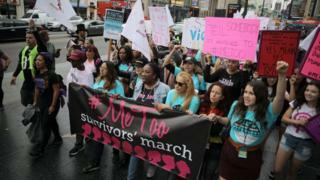 The #MeToo hashtag was first used by social activist Tarana Burke and popularised by actress Alyssa Milano in the wake of the Weinstein allegations. Ms Burke led Sunday's march. "For every Harvey Weinstein, there's a hundred more men in the neighborhood who are doing the exact same thing," she wrote on Facebook ahead of the event. "What we're seeing, at least for now, is a unity of survivors, a community of survivors that have grown out of this #MeToo viral moment, that I'm just hoping and praying that we can sustain." The actor Kevin Spacey and comedian Louis CK are among the high-profile figures accused of sexual harassment over the past few weeks. "The power I had over these women is that they admired me. And I wielded that power irresponsibly," he wrote.